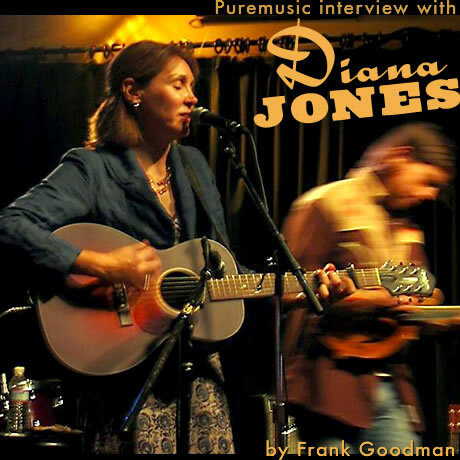 I first met Diana Jones in passing at a friend's Xmas show, and thought she stood out unusually, in an old world way. When, a few months after, I bumped into her at a Folk Alliance, she and I talked a little in the lobby and I was very impressed. She was not running the usual social software, there was something special there. So when I got a recording of her in the mail, it didn't sit around the way they tend to in this house of records. I put it right on, in a kind of a "let's get to the bottom of this, shall we" mood, positive version. The first song, "Pretty Girl," was arresting in the down home delivery of its message, basically "I don't want to be a pretty girl for you," and I thought, they're going to play that. The tractor beam intensified over the next couple of tunes, until the fourth one, "Pony," a very rare song about a Native American girl. That tune short circuited my mental faculties and hot wired my self into the music of this person that I realized I didn't know the first thing about. Then I started over, and started to listen for real. As many of you know, that's a completely different process that incorporates presence, something in modern day culture that has grown, sadly, rare. And that's exactly what Diana Jones brings to the game, especially in her writing. I love the material on this powerful debut, My Remembrance Of You, so now I'm hungry to hear the other several albums she's written alongside and since, to which she refers in our conversation. But this little record took off in such an unpredictable way that it has kept her on the road for a year and half solid, and threatens to do at a whole new level, since she now has been released in the UK (where she is selling out shows in places she has never been), and in the US has been picked up by Ryko distribution, which will put her work at arms length to all who have been hearing about her this last very busy year or so. When good things happen to good people and great artists, it's like everything is right in the world for a moment.